Halo Cinematic boasts a 2,000 square foot warehouse space for rent located conveniently in the heart of San Diego on Miramar Rd. 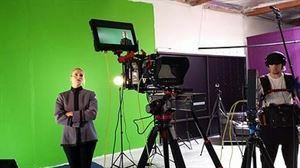 The working film studio is suitable for rehearsals, meetings, film shoots, photo shoots, green screen shots, networking events, social gatherings, table reads, audition space and more. Use our open warehouse with high ceilings to fit many different needs!